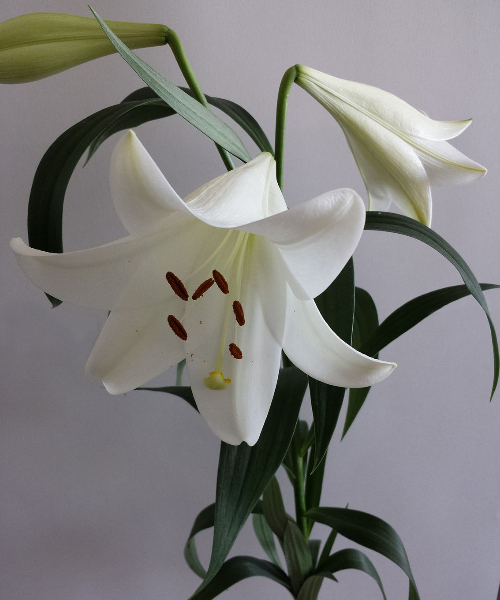 Longiflorum Lilium flowers have large, bowing and pure white blooms. These trumpet-shaped flowers are commonly called Easter lilies because Christians consider it as a symbol of the resurrection of Jesus Christ. Lilium longiflorum (Japanese: テッポウユリ, Teppouyuri), often called the Easter lily, is a plant endemic to the Ryukyu Islands (Japan). Lilium formosana, a closely related species from Taiwan, has been treated as a variety of Easter lily in the past. It is a stem rooting lily, growing up to 1 m (3 ft 3 in) high. It bears a number of trumpet shaped, white, fragrant, and outward facing flowers. Longiflorum Lilium flowers are endemic in Japan, but here at Floraco, we also culture them in modern, computer-controlled growing facilities. Trust that when you turn to us for wholesale Longiflorum Lilium flowers, we will be able to supply you with fresh cut plants. Contact Floraco now!